When people want to find real world services like plumbers or auto mechanics the yellow pages was where they went, now Google, Bing and Yahoo are dominating the world of local search. Listing your business with these search engines gives your business added exposure while giving them exactly what they need and want when displaying search results. 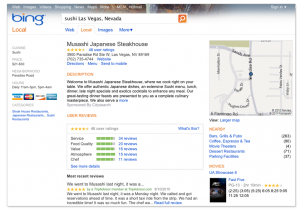 These services also place a higher value on these listings often placing them before other search results. With Google Places you are able to control how your business is represented in regular search results as well as Google Maps. Some features of your listing may not be as obvious. Including your name, location and brief description your listing also offers you the ability to specify operating hours and payment options. As Google has expanded Places to compete with other services they have added the ability for business owners to create coupons that customers can print out and bring with them. Another great feature is the ability for people to rate, or leave reviews of your business while also giving businesses the ability to respond to those reviews. Yahoo! has two offerings for businesses looking to list themselves in their directory, Basic and Enhanced. The Enhanced package includes options like reporting of statistics, a 3,000 character descripiton, a photo on your listing plus a photo gallery, company tagline and coupons and promo links… it just costs $9.95 a month! The Basic listing is much more limited in features but it’s free. For the price of zero you can Display your address, phone number and website URL as well as place your business in up to five categories, list your products, services, brands and more. The Bing Business Portal (Beta) or BBP allows businesses to claim, enhance and manage their listings in the directory. Like Google and Yahoo! your listing will include your location, hours of operation, payment options and reviews left by customers. You can also add links to Twitter and Facebook as well as identify key search categories where you want your listings to appear. Logos and photos can be added as well as custom menus for restaurants and bars and of course coupons can be created as well. If you are a restaurant or bar and are registered with Open Table you will see a reservation function on your local listing page. Bing also creates a mobile site for your menus and sends you a QR code to use so customers can access the mobile site with their smarphones.